It was a difficult time for me, after university moving in back home, where my failure to gain a degree did not sit well with my father. My parents marriage had reached a low ebb at this time, and I just got in the way. 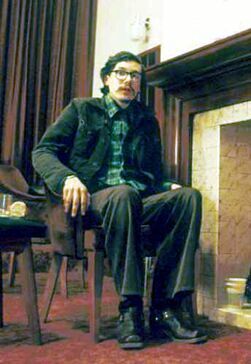 My brother by this time had gone away to university himself to disappear from Coventry for some years. There was a constant barrage from my dad to do something useful and get a job. It was not easy of course but I did manage to get something which surprised him as much as it surprised me, because although he would taunt me it took the wind out of his sails when I managed to do something because he never really expected I would. It was not much of a job though. It involved going around various houses pretending to carry out a survey, but diverting the conversation into the benefits of life assurance, coupled to an investment plan. It was a learnt script really. I did not have the confidence to carry it out well and I felt it was dishonest, but it gave me a wage for a while. I think the company policy was to take on as many new people as possible, throw them out into the arena and see which ones would make good sales people in the end, and expect the majority to drop out after a short while. Those who did well could expect to make a huge commission. I dropped out, never having sold a single policy. After that the only work I could find was a few temporary jobs, which did not amount to much. I still went up to the University in the meantime. As much to get away from home as for anything else. The job involved evening work mainly because that was when most people were in. I was still allowed to write for the Students newspaper even though I was no longer a student. I found a way to write for the Students newspaper even though I was no longer a student. They put in an article saying I had died in a motor accident and they had discovered posthumous material they wanted to publish as a tribute. A bit silly really as everybody could see I was still walking around and not a ghost! I did a sort of parody of star wars with well known people on campus as the characters, all done in a Hitch Hikers Guide to the Galaxy type of humour. I am not sure whether this even pre dates Douglas Adams. Musical Talent - I also found ways to put my new found musical talent to use, following in my dads footsteps and performing at folk clubs. This was a strange thing to do for someone with as little confidence as me, but I used to dissociate from the performance and play as if it were not me, doing it watching my fingers as they made these sounds on the flutes and whistle. I also sang, as I enjoy singing, and joining in choruses in an uninhibited way. Whenever I go to church I do not hold back in the hymn singing like most people seem to do, I bellow for all I am worth. My music actually got a little write up in the local folk magazine where I was called a talented multi instrumentalist. Multi instrumentalist was a sort of catch phrase for anyone who had more than one instrument. 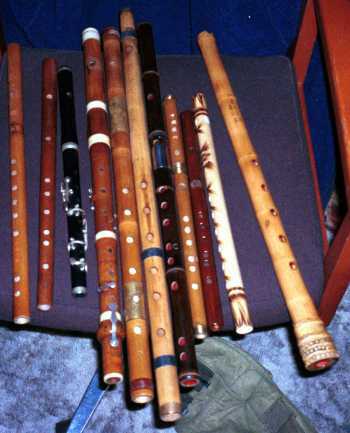 I had built up quite a collection of whistles, oriental bamboo flutes of all sizes and a fife. (sounds like another obsession to me). Whenever I do anything I don't do it by half. Anyway, I was invited to be part of the band for a group of Morris Men locally. This was fun, although I suppose to some people we looked rather silly all dressed up. We went around all sorts of places and folk festivals. We also drank a lot of beer. If you think Rugby clubs can drink, you should see what Morris Men can put away. Unfortunately I was eventually asked to leave the Morris Side after I made some social faux pax and upset the landlord of the pub where we practised. To this day I don't know what I was supposed to have done, but that is an occupational hazard of life with me, poor social skills and too much beer are not a good combination. I just don't understand other people most of the time (or all of the people some of the time). Family disintegration - Family life got worse, and I worse forced to leave home. I was given an ultimatum and a week to move out. I could so easily have ended up on the streets at this point, like so many other young people nowadays, but I got lucky and the Council offered me a place, on one of the worst estates in Coventry mind you, but beggars can't be chosers. I would not have managed if it had not been for my mother, who took time off to come up and do things for me like cooking, and cleaning and helping out with money. Later on I was to pay her back in other ways, with interest. The year is now 1980 and that is significant. I made some attempts to better myself and improve my chances of finding work. I tried to enrol on various courses, but I always failed the pre entry tests because of my poor numeracy, but I did eventually get on one non exam course designed for unemployed people to give them and idea of industrial and clerical procedures and that was at Tile Hill College. It brought me back into contact with people again as by now living on the other side of town from where I was brought up, I had lost contact with just about everybody I ever knew and was on my own again. It did not lead to work. 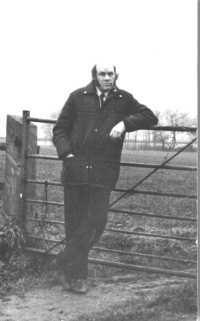 A prophecy - On Good Friday in 1980 in the early hours of the morning, that is well before dawn, I had what I can only describe as a psychic experience, particularly in the light of what happened afterward. I was looking out across my darkened kitchen toward the BBC radio transmitters at Rugby which were then visible from my window as lights in the dark, when I perceived a particularly bright flash of light. Now to be fair I do suffer from visual disturbances which do include random flashes of light, but normally I pay them no heed, but somehow a message was conveyed into my mind, that a year to the day, something very good was going to happen. The message was not conveyed in verbal form, but in concept in a way I cannot really describe. I spontaneously recorded the event in a poem, which had no particularly meaning other than being fine sounding words, but has borne a particular interpretation since in the light of everything that happened to me. This experience was so real that I did not fear to tell anyone about it, in a totally convinced manner that something was to happen on that day a year hence. This is what is remarkable, because on good Friday in 1981 an event happened that led to circumstances which changed my life entirely. More background - my mother who had not been well for a long time, became diagnosed with Rheumatoid arthritis. I remember her tears as she came home from the doctors that day. I had arranged to be at the family home as she needed someone for support. My dad as I said before had a personality disorder of some kind, and he had a particular outlook on life that was not real. He had an idea of family life which seemed to come more from story books than the real world. Perhaps because he had such a confused upbringing himself he idealised family life to be something it wasn't which was why I and my brother were such disappointments to him and had to leave home. roots of Rugby's tall red radio tower. To tell a tale or visit of a vision. I will elaborate the poem which is expressed in religious terms and all a bit stream of consciousness. Tongue twisted = the unspeakable nature of the experience. Radio towers = the scene I was looking out over at the time. Strange track, = the path I am to take. Gethsemane = the fact that I felt I were myself in the Garden of Gethsemane facing a bitter cup that I could pass up or drink, whilst all the disciples were sleeping at that hour. Tekel Upharsin is a a coining from the "mane" syllable in Gethsemane referring to the proverbial writing on the wall at Belshazzars feast - "mene mene tekel upharsin", commonly translated as I have been weighed in the balance and found wanting, or in this case a message to me "now is the time to stand up and be counted". For more poetry follow this link.